Sunday’s starter goes from “Zito” to “TBA” — What are San Francisco Giants’ options at this point? 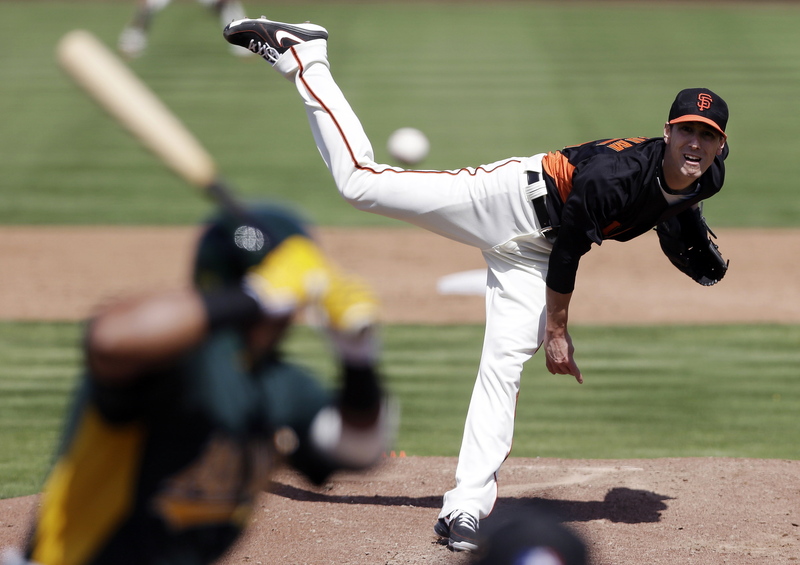 Sunday is Barry Zito’s turn in the rotation. MoreSplashHits remains completely baffled as to why the Giants didn’t use Monday’s off-day (not to mention last Thursday’s) to skip Zito’s turn in the rotation. Then they could have given Zito some time in the bullpen to work on his delivery, while Chad Gaudin, Matt Cain and Madison Bumgarner pitched in Philly and Tim Lincecum, Zito and Gaudin pitched in Tampa. Instead, they said the ONE GUY who has been terrible on the road and make him the only pitcher to be slated for two starts on the six-game road trip. Now, they find themselves looking for a replacement starter possibly on Sunday. So what are the options? Ryan Vogelsong: Vogey made his second rehab start after his long DL stint with a broken finger Tuesday in Richmond. That would put him on pace to pitch Sunday. But manager Bruce Bochy said Vogey will remain on his original rehab schedule, which is to pitch Sunday for Double-A Richmond. If all goes well, he will return to pitch for the Giants on Aug. 9 at home against the Orioles … in Zito’s spot in the rotation. Guillermo Moscoso: The Giants acquired Moscoso from the Cubs a week ago just for this situation. Moscoso, 29, was 7-5 with 3.93 ERA in 17 starts for the Cubs’ Triple-A team in Iowa. 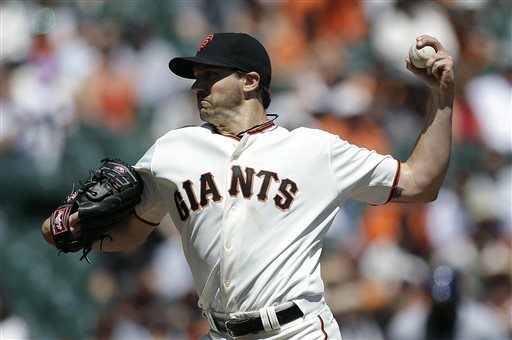 He had a shaky debut for the Giants in relief of Zito on Tuesday. He gave up a single, intentional walk and hit batsmen before escaping without giving up a run in the fourth vs. the Phillies, set down the side in order in the fifth, then gave up another walk and a two-run homer in the sixth. Eric Surkamp: Zito could develop some mysterious ailment that would prompt a trip to the DL — or he could be DFA’d — creating a roster spot for Surkamp. Surkamp struggled in his first big-league start since Tommy John surgery, giving up seven runs in 2.2 innings vs. the Reds on July 23. Surkamp was optioned to Fresno on July 24, meaning he needs to stay at Triple-A for 10 days. That period would expire Saturday, allowing the Giants to recall him to start on Sunday. In his first start back at Fresno, Surkamp gave up one run on three hits over seven innings on Tuesday, putting him right on pace for a Sunday start. Pray for rain: Rain is the forecast Thursday in Philadelphia. The two teams will wait out for a window to play for as long as possible as Thursday’s game is the last scheduled in 2013 between the two teams. 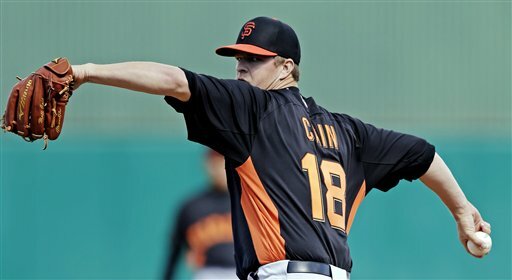 But if the game is postponed, then Cain starts Friday in Tampa, followed by Bumgarner and Lincecum. That would give the Giants the option of pitching Zito on Monday in San Francisco against the Brewers, where he’s had more success. Who is Giants’ odd man out when Ryan Vogelsong return: Chad Gaudin or Barry Zito? Chad Gaudin did it again on Friday. Gaudin, the journeyman pitcher who joined his Xth team this spring when he signed with the Giants, turned in his best performance of the season when he limited the Diamondbacks to three hits and no walks or runs over seven innings in the Giants’ 2-0 win on Friday. He struck out eight, improved his record to 4-1 and lowered his ERA to 2.15. He is 4-0 with 2.23 in seven starts since moving to the rotation in place of the injured Ryan Vogelsong. Since coming off the DL after being hit in the arm with a line drive, Gaudin is 2-0 with 0.95 ERA over three starts. Manager Bruce Bochy admitted that it would be hard to remove Gaudin from the rotation when Vogelsong returns from his stint on the DL next month. So it left many Giants fans to wonder: Who goes to the pen when Vogey returns? Vogey? Gaudin? Tim Lincecum? Barry Zito? Well, the answer may have come Saturday afternoon. Ryan Vogelsong threw 40 pitches in the bullpen, then 35 more from the main mound at AT&T Park to coaches Shawon Dunston and Roberto Kelly as well as outfielder Gregor Blanco. Barring any setback, Vogelsong’s next step to pitch in an Arizona Rookie League game next week, then a start with Class A San Jose and another with Double-A Richmond. The “soft” return date to the Giants is Aug. 9. August 9, eh? Hmmm. That could be very telling. Take a look at how the Giants’ rotation sets up between now and then. Jul 23 DH vs. Reds (Zito and TBD – either Yusmeiro Pettit, Mike Kickham or Eric Surkamp; Pettit seems longshot as it would require opening a spot on the 40-man roster). Now, the Giants have two upcoming days off — July 25 and July 29. If they stay on turn, Zito would pitch on July 30 in Philadelphia to open a six-game road trip. It would also mean Zito would pitch twice on that road trip. That would mean that Zito’s next turn in the rotation would fall on August 8, at home vs. the Brewers. 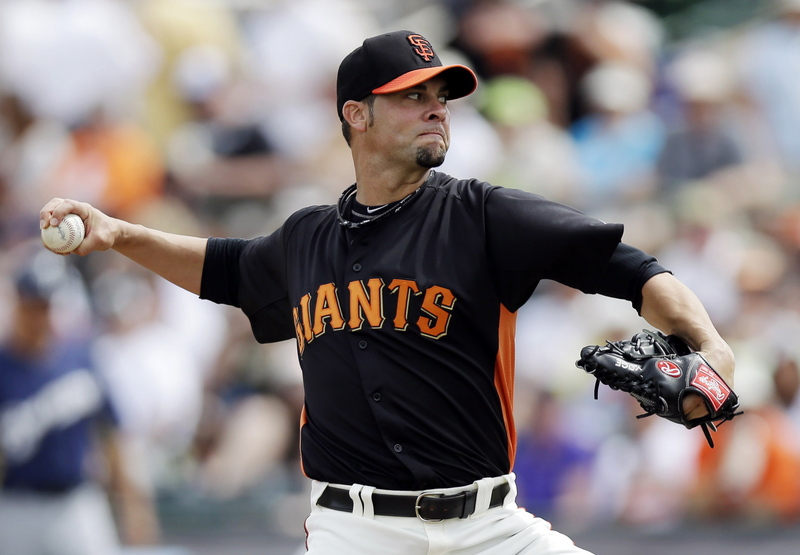 Vogelsong’s soft return date is Aug. 9. That means Vogelsong’s soft return date would plot him right between Zito and Gaudin in the rotation, meaning either could easily be bumped. Or the Giants could even tinker with a six-man rotation, in which Zito gets skipped on the road. Seven innings, zero runs. Sound familiar? Well, of course, that’s what Barry Zito did in his first start this season at AT&T Park. You know how they post Ks on the right-field wall at AT&T Park for strikeouts by Giants pitchers. Well, maybe when Barry Zito pitches at AT&T, they should post zeros instead. Zito improved his string of scoreless innings at home to 21 innings this season with another shutdown performance Sunday in a win over the Padres. It is also the 10th consecutive Barry Zito start at AT&T Park that the Giants have won, dating back to last postseason and regular season. Sunday’s outing dropped Zito’s season ERA to 3.42, and it was the second win this season by the Giants that didn’t require a save or a walk-off hit. The other game also was a Zito start. Who would have thought the day when Zito starts is the day the bullpen gets some rest? And there was some more good news for the Giants. Buster Posey smacked his first home run since Game 4 of last year’s World Series — and that includes all of spring training — when smacked a two-run shot to left in the fifth inning. It was also the Giants’ first home run this season not hit by a guy named Pence (4), Sandoval (3) or Crawford (3). Chad Gaudin pitched the final two innings without giving up a run to lower his ERA to 0.73. 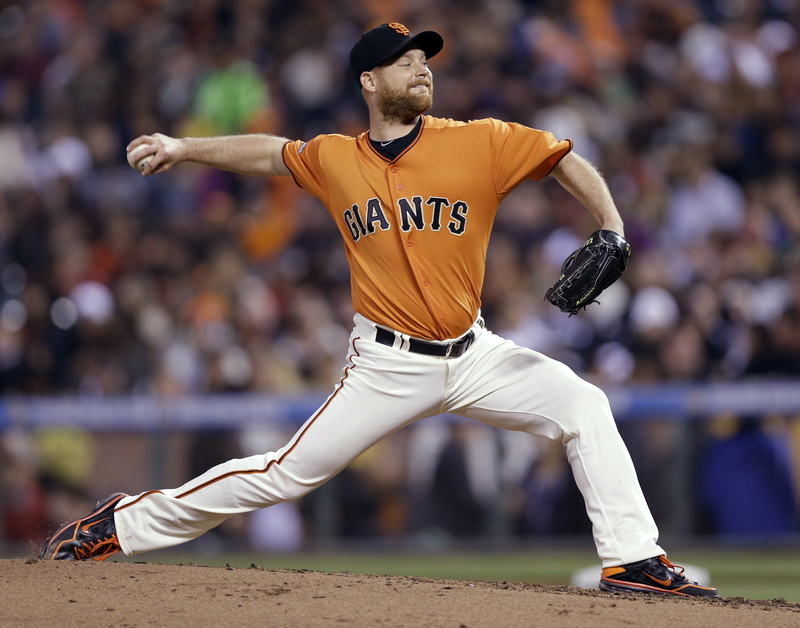 It was the Giants’ major league-leading fifth shutout win of the season. Three of those wins were games started by Zito. It was the Giants’ second consecutive three-game sweep at home. The win improved the Giants’ record against NL West foes to 8-1. They’ve won eight in a row since losing the season-opener to the Dodgers. Because of his ugly outing in Milwaukee, Zito is averaging just under 6 innings per start this season. At that pace, he would pitch 189.1 innings if he makes 32 starts. Important to note because his $18 million option for 2014 kicks in if he pitches 200 innings this season. So when you were in school, did you prefer teachers who graded on letter grades (A, B, C, etc.) or on a strict percentage basis (100%, 90%, etc.)? I preferred the letter-grade system. Why? Under that system, a failure is a failure. If you bomb a quiz, you regroup and come back next time. But under the percentage system, there are degrees to failure: 50 percent, 40 percent, 30 percent, etc. If you bomb a quiz under this system, it could take you a long time to recover. If people use the ERA as way to grade pitchers, the majority of Giants starters are failing. But ERA penalizes degrees of failure, which are very difficult to recover. If you give up six runs in a game, you’re probably going to lose. So if you give up an seventh run, eighth run or ninth run, those runs generally don’t turn many wins into losses. But they can blow up an ERA. And it’s easier to blow up an ERA than it is to fix it. So let’s break down the Giants starters. First off, we’re going to excuse Madison Bumgarner from this exercise, because’s he’s been the teacher’s pet with his 1.77 ERA. Go out and play, MadBum. Eight of his nine earned runs came in 2/3 of an inning on Monday. In his other 16 innings, he’s allowed one run or an 0.56 ERA. Nine of his 10 earned runs came in two innings of work. In his other 14 innings, he’s allowed one run or an 0.63 ERA. Nine of his 11 earned runs came in 2/3 of an inning against the Cardinals. In his other 16 innings, he’s allowed two runs or 1.13 ERA. Seven of his 9 ER came in two innings. In the other 9.1 IP, he’s allowed two runs or 2.00 ERA. Even if you looked at the team’s ERA, which includes the bullpen, right now the Giants rank 11th in the NL with a 4.26 ERA. But if you removed Cain’s nine-run inning and Zito’s eight-run inning, suddenly the Giants’ team ERA is 3.08 or second-best in the NL. Bottom line, blow-up innings are rare, but damaging to an ERA. They skew the numbers. If you look harder, the Giants pitching is just fine. Yeah, Barry, we got that. 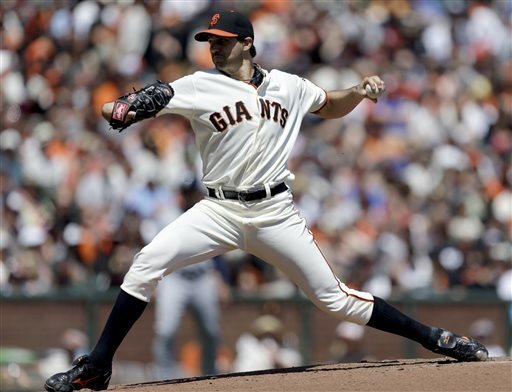 Zito came into Tuesday’s game against the Brewers have thrown 14 scoreless innings. He left Tuesday’s game with a 4.86 ERA. The Brewers tagged Zito for nine earned runs in less than three innings of work, including eight runs in third inning alone. Yikes! And the Giants are 9-5? The Giants had won 16 consecutive games, including postseason, and 13 in a row in just regular-season games when Zito had started dating back to last August. But that streak is over. Now the longest streak for Giants wins in games started by a particular pitcher during regular-season games belongs to Tim Lincecum, with four. Zito said that he actually felt better Tuesday than he had in his previous two starts. And even after he got himself into trouble in the third, you thought it was possible that he might get himself out of the mess. It all started with a single to the opposing pitcher, Wily Peralta. Then Zito hit Norichika Aoki — on a 1-2 pitch. Jean Segura hit a ball that Brandon Crawford was able to get to, but not able to corral. It went for an infield single and the bases were loaded. Then Zito struck out Ryan Braun. After falling behind 2-0 to Rickie Weeks, Zito evened the count to 2-2. But Weeks worked the count full, then hooked a pitch right on the left-field line for a two-run double. Jonathan Lucroy’s single made to 5-3. OK, no problem. The Giants have rallied before. They could do it again. But Lucroy’s single was followed by one from Alex Gonzalez, and another from Carlos Gomez to load the bases again. Then came the big blow: a grand slam from Yuniesky Betancourt. The Giants go to Milwaukee and get beat by Yuniesky Betancourt. Suddenly, it was 9-3 Brewers in the third. And yet, the Giants weren’t out of it. So much so, that they would actually wind up regretting some missed opportunities. Brandon Crawford’s home run in the fourth made it 9-4. A Pablo Sandoval single in the fifth made it 9-5. The Giants loaded the bases with no outs, but could only add one more run on Brandon Belt’s sacrifice fly, even though it looked for a moment that the ball might sail over Braun’s head for a bases-clearing double. Instead, it was just 9-6 Brewers. The Giants loaded the bases again in the sixth, this time with one out. But again, only got one run on a Sandoval sacrifice fly, cutting the deficit to 9-7. That’s the closest the Giants could get. Now they find themselves 9-5 overall, and a half-game behind the Colorado Rockies in the NL West. The Rockies are now 10-4: 0-3 vs. the Giants and 10-1 against anyone but the Giants (actually it’s just the Pirates, Padres and Mets). Yeah, it’s a strange game. Six months later, and the St. Louis Cardinals are still looking to score a run at AT&T Park … or against Barry Zito. After being shut out in Game 7 of the National League Championship Series, the Cardinals have now played 21 consecutive scoreless innings at AT&T Park, thanks to Barry Zito. 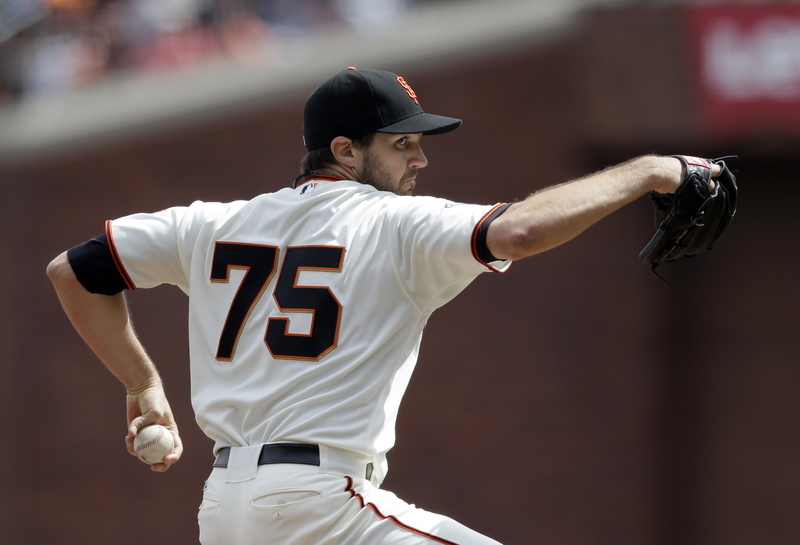 Now be honest: How many of you expected Zito to extend the Giants’ run of starting pitchers giving up no earned runs? Probably a similar number of those who thought the streak would last past Tim Lincecum. But Zito was on again, pitching seven shutout innings, giving up four hits and three walks as the Giants won their home opener over the Cardinals, 1-0. Here is the extent of the Giants’ offense on Friday. Zito bunts, but Yadier Molina (of all people) mishandled the ball, and Zito is safe on the error. Angel Pagan walks, Blanco scores. And then, if things weren’t strange enough, the Giants’ best contact hitter — Marco Scutaro — comes up in a contact situation … and strikes out swinging. As it turned out, that one run is all that Zito and the Giants would need. Zito continue his mastery of the Redbirds. If you added his seven shutout innings Friday to the 7.2 shutout innings he threw in Game 5 of last season’s NLCS and the two shutout innings on the back end of a quality start in St. Louis on Aug. 7, it makes 16.2 consecutive shutout innings by Zito against the Cardinals. 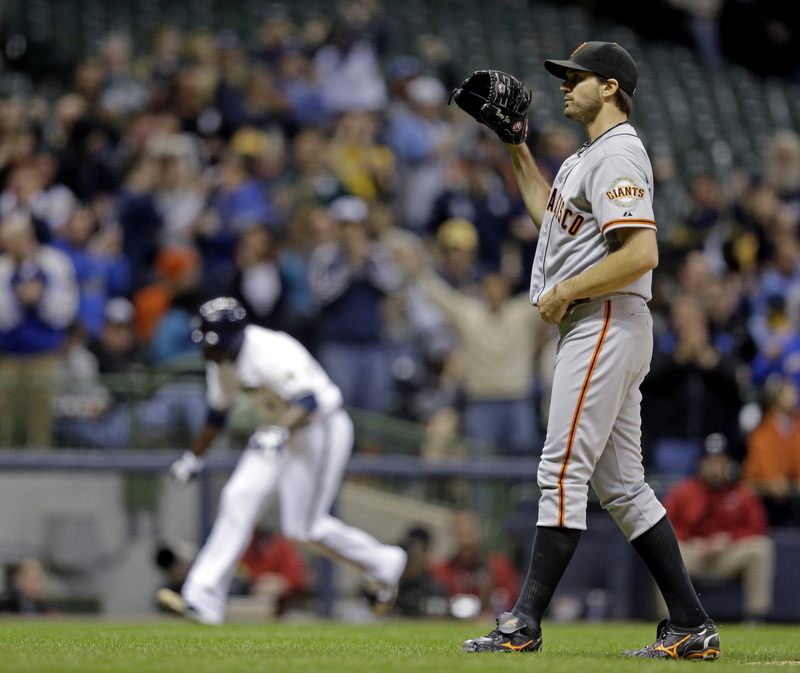 It also marked the 15th consecutive start — including last postsesaon — that the Giants won a game in which Zito started. Zito’s start Friday marked the first time since the 1976 Milwaukee Brewers that a team had starting pitchers not allow an earned run in the first four games of the season. The Brewers, by the way, went 66-95 in 1976 in Hank Aaron’s final season. Here’s another interesting stat: The last time the Giants won a game started by Zito by a 1-0 score came on July 16, 2010, when Zito pitched eight shutout innings on two hits, two walks and 10 strikeouts against the Mets. And now the Cardinals get Ryan Vogelsong on Saturday.